* Backstop distance increased to 67 feet circa 1990, and was later reduced to 52 feet. I remember what a huge impact the Astrodome had on baseball when it was built in 1965, back when the space race was in full swing, the economy was booming, and no one questioned the unstoppable March of Progress. Actually, this revolutionary dome-stadium concept had been considered in Brooklyn back in the 1950s, but when the city resisted sharing the cost of the proposed "Sports Center," the Dodgers split. Houston made sure that the their new space-age sports palace would have every possible amenity, including seats that were upholstered and cushioned. Inherent defects in this marvelous climate-controlled sports arena were soon revealed, however, as the glare from the roof window panes prevented fielders from seeing fly balls. In response, the panes were painted dull translucent white, but the consequent reduction in sunlight killed the grass. They tried various remedies and even painted the dead grass green for a while, but the Astros had little choice but to install a new-fangled artificial playing surface that became known as Astroturf. This terrible "plague" was unleashed in 1966. For five years the entire infield was dirt, but in 1971 the infield was covered with Astroturf except for the areas around each base. Exemplifying the "cookie-cutter" design that was all the rage back then, the Astrodome was almost perfectly symmetrical. It had the same kind of "paired swivelable circular section lower deck" (PSCSLD) configuration that Shea Stadium had pioneered the year before. The original outfield dimensions were 406 feet to center and 340 to the foul poles, but the diamond was moved and inner outfield fences were installed in 1972, reducing the distances by several feet. The original longer dimensions were restored in 1977, but in 1985 they once again reduced the distances. It didn't seem to help much, as the Astros never won a National League pennant while playing in the Astrodome, though they did win divisional titles in 1980 and 1986. It took another decade before the next domed baseball stadiums arrived on the scene: the Kingdome in Seattle, and Olympic Stadium in Montreal. The Astrodome was also the first stadium with five distinct seating levels: it had two main decks, a small (seven-row) middle deck (loge), a very small suite / press box level, plus a skybox level near the roof. The very top rows of the upper deck were partly obstructed by supporting columns, an ironically archaic situation for such a "space age" stadium. As originally constructed, there was only a single level behind most of the outfield. The seating sections in center field were 10-15 feet lower than the upper, non-movable part of the lower deck that extended around the right- and left-field corners. This was aimed at bringing the outfield seats closer to the baseball action. The only other place where this version of the PSCSLD configuration was used was in (the new) Busch Stadium II. Those center field seats also extended back an additional ten or so rows, and the original scoreboard was actually above them. The Houston Oilers shared the Astrodome with the Astros from 1968 through 1996. In response to pressure from the Oilers' owner who wanted to sell more tickets, in 1989 the Astrodome underwent a major expansion that raised its baseball seating capacity by 7,000 seats. After 24 years, they finally got around to extending the upper three decks all the way around the outfield. However, this eliminated the big scoreboards that used to line the huge walls behind the "bleachers," so they built new scoreboards in the right- and left-field corners. This was the apparent reason for the decrease in the distance to the foul poles from 330 to 325 feet in 1992. Also in 1989, four large cylinders with entry/exit ramps were constructed outside the dome, and three scoreboards / video displays were installed in the upper deck, permanently blocking many seats. At about the same time (1990? ), the diamond was apparently moved about six feet forward, reducing outfield distances and increasing the backstop distance. The last major change took place some time during the 1990s, when extra rows of box seats were added between the dugouts, reducing the backstop distance to 52 feet. As it turned out, the enlarged seating capacity at the Astrodome did not satisfy the Oilers, and in 1996 they announced they were moving to Tennessee. After one year of uncertainty in Memphis, they changed their name to the "Titans" in time for their arrival in Nashville. Leaving Houston only eight years after the Astrodome was expanded made all that investment as a terrible waste. Those upper deck outfield seats were hardly ever used for baseball games. As with Shea Stadium, this dual-use circular stadium lost its reason for being when the football team left town, and the Astros realized that their "space-age" wonder had become an archaic burden that they could never hope to fill. So, they persuaded the Houston city government to chip in and build the ultra-modern "Enron Field" (now called "Minute Maid Park") in downtown Houston, where they moved in 2000. In October 1999, 48,553 people watched the Atlanta Braves win the last game ever played at the Astrodome, thereby advancing to the National League Championship Series. The Astrodome hosted the 1992 Republican National Convention, at which famous Texan George H. W. Bush was renominated for president. To make room for the Republicans, the Astros spent most of August on a road trip. This was one of only two baseball or football stadiums in which a national party convention was held, at least in part. The others: Louisiana Superdome (GOP, 1988) and Denver's Invesco Field (Democrats, 2008). In September 2005 the Astrodome became the principal temporary housing facility for several thousand survivors of Hurricane Katrina, most of whom were from New Orleans and had initially taken refuge in the Superdome. In recent years it has become a little-used relic, playing second fiddle to next-door Reliant Stadium, home of the NFL expansion team Houston Texans. In November 2013 voters rejected a referendum that would have renovated the Astrodome, making into a convention center. Within a few weeks, demolition crews began removing the circular exit ramps added in 1989. It was expected that the rest of the stadium would be taken down in 2014, but those plans are on hold. As of April 2015 (the Astrodome's half-century mark), discussions on possible ways to make use of the old dome are continuing. 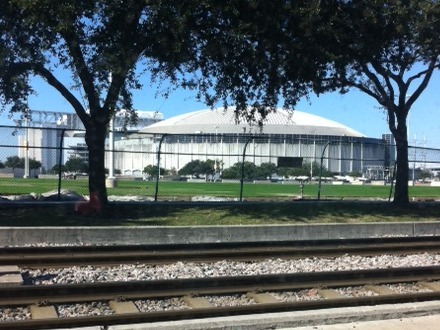 The Astrodome, with railroad tracks in the foreground. To the left is the much taller Reliant Stadium, home of the NFL Houston Texans.